The French word, châtelaine, referred to the keeper of the keys to the castle in the Middle Ages. The guard who was responsible for the keys wore the châtelaine at his waist or pocket. 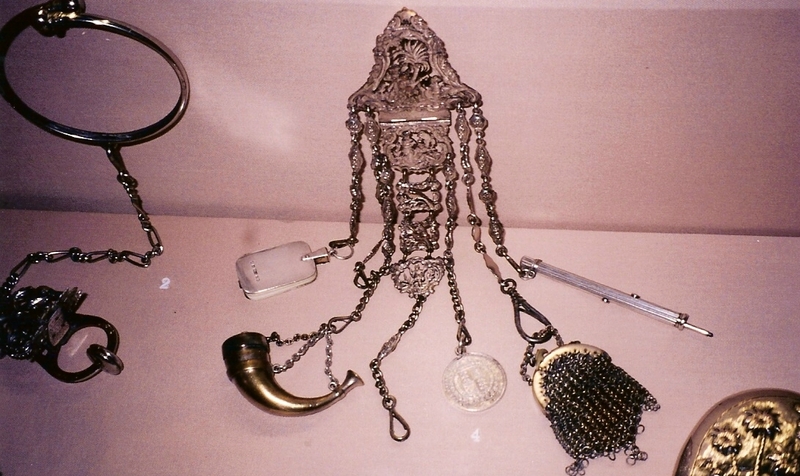 In 17th century England men and women wore this decorative ornament on which to hang small household items. Attached to a pocket or waist, they had chains with a swivel hook at the end of each to hang tools which might be needed to perform daily duties. Keys, writing paper, pill bottles, writing implements, scissors, eyeglasses, or a watch are just a few of the items that might be found on a châtelaine. As pockets became a part of daily attire and coin purses became more common, the châtelaine was repurposed. The châtelaine became more commonly used for sewing equipment, smelling boxes, and watches. The popularity of the châtelaine dwindled at the end of the 19th century as dresses with no waistline or pockets became increasingly more popular. More recently stitchers have made their own châtelaines on which to hang their scissors, thimbles, needles, and other stitching implements. To see truly historical châtelaines one needs to visit a fine museum. The pictured châtelaine in this blog is a personal photograph that I took at the Victoria and Albert Museum in London.